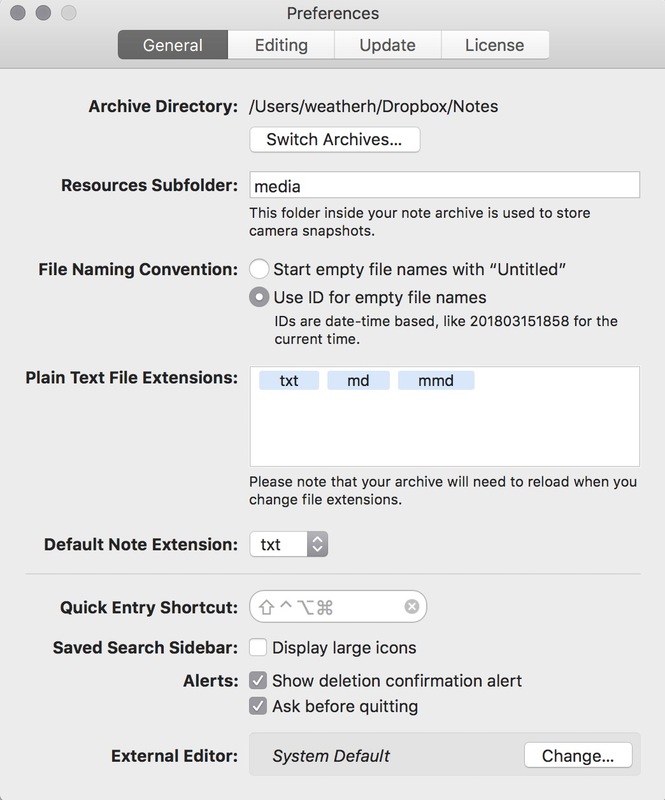 The Archive is a new plain-text writing and reference application for the Mac.1 It's made by people that are super-nerds about plain text and has a lot that looks familiar and a lot that is new and clever. This is not a review. It's a highlight of what's neat and innovative. The Archive is designed around what Notational Velocity and later nvALT brought to the Mac: Fast, reliable search with ease of creation. As both of these applications lost their luster as macOS advanced, I left them behind in a favor of less buggy and more versatile tools. The Archive is the first application to come along that is really making me reconsider moving my note collection out of Dropbox. Everything in The Archive is text. 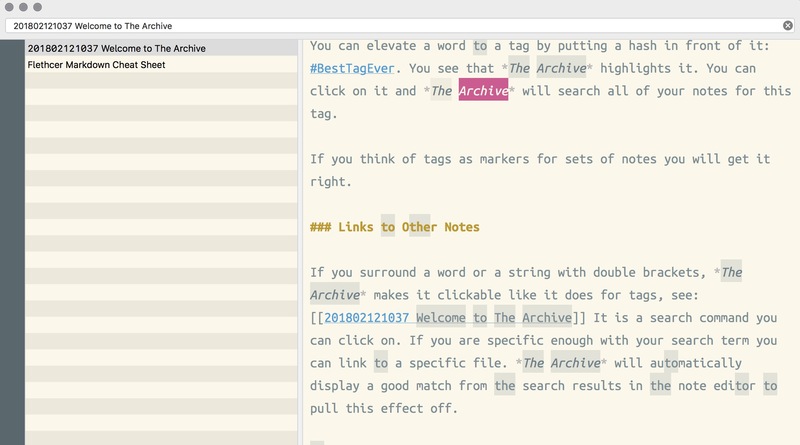 You write in Markdown.2 Your work is interactive through the "Omnibar." The Archive embraces its instant search as a navigation tool. The Omnibar is how you get around in your massive collection of notes. 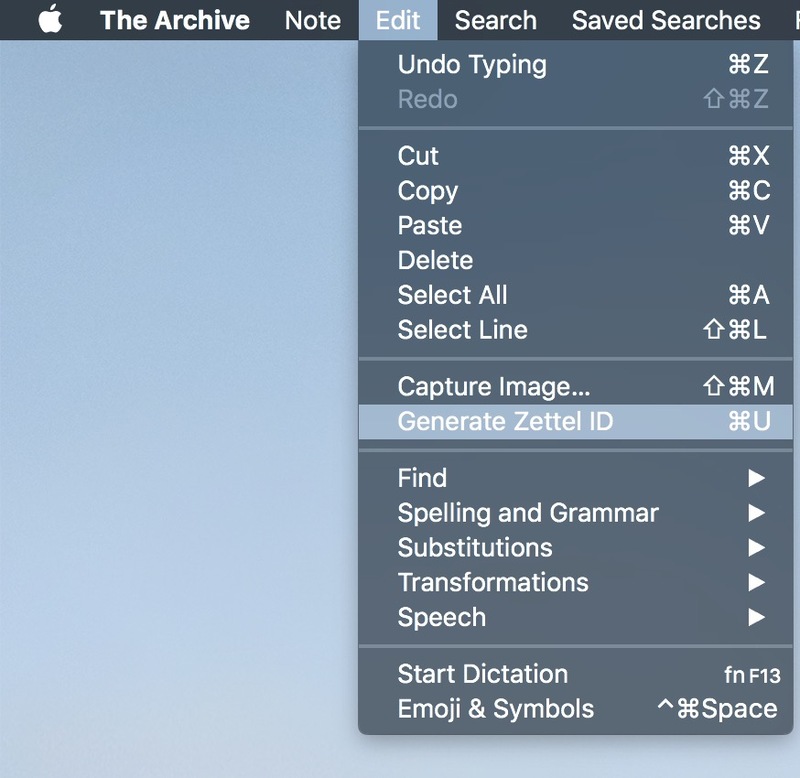 Search is such a core feature that The Archive has an entire side-bar dedicated to saved searches. These are customizable with custom icon support and even hot-key triggers. You add a tag in your document by prefixing with a hash. Clicking a tag immediately shows the search results for that tag. You link to other notes with double brackets. Clicking the link instantly shows the search results for that document name. 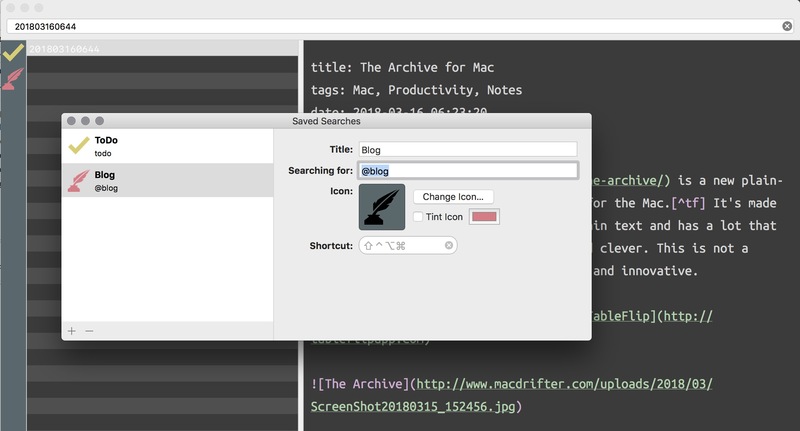 It's a clever way to add pseudo-wiki linking without requiring hard links between documents. The Archive is made by people that have become experts at linking documents to make a knowledge archive. They kind of wrote an entire website about it called Zettelkasten. It shows in some of the features of The Archive. 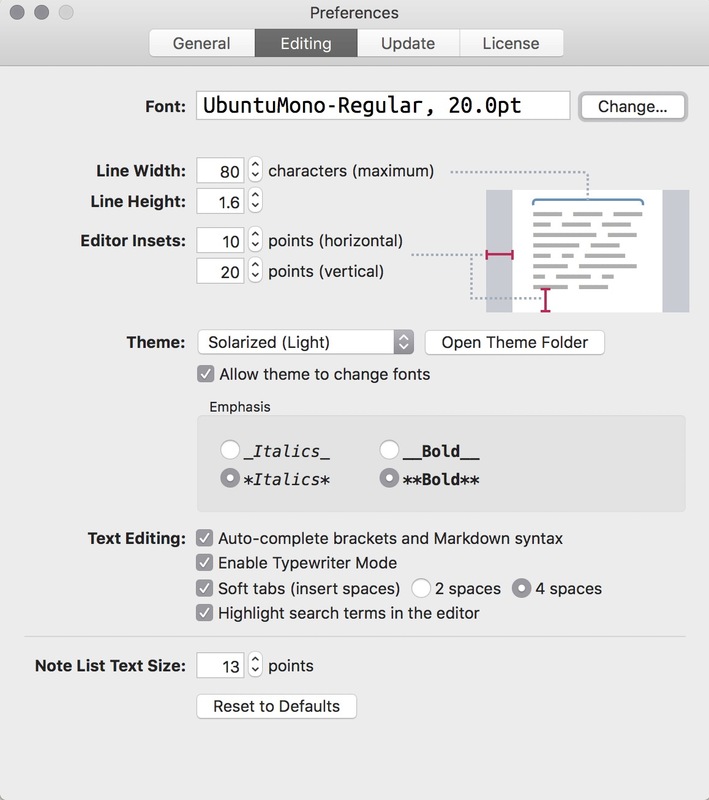 You can generate a unique document name right from the Omnibar or selecting some text and hitting ⌘-U. It's not just a blunt tool to mash words. It's beautiful. Of course it has Solarized themes built in but there are lots of options to tweak the appearance. It's a pleasure to write words in such a well designed, and simple, interface. I prefer the Tomorrow theme. Now, what all of you other text-nerds are waiting for: the preferences. The Archive is $20 with options to get discounts. I'm happy to pay for this kind of innovation in the text-editor market. For a 1.0 version it's very well made. It's fast and enjoyable to use. I'd like to see more options for writing in Markdown and MultiMarkdown as well as integration with Marked for previewing. None of that stops me from enjoying what it has right now. Now, excuse me while I go obsess over what a Zettelkasten is.